This cruise is ideal for combining with Darjeeling, Sikkim or Bhutan. Highlight of the cruise is a visit to Manas National Park on the Bhutan frontier, but also featured are temples, tea gardens and craft villages. This 10-night cruise covers most of the highlights of Assam, with elephant and jeep safaris looking for rhino in Kaziranga National Park, visits to the old capital of the Ahom kings and to the Hindu monasteries on Majuli Island, walks in tea gardens and through tribal villages. It is also available on selected dates in separate 4-night sectors, Assam Despatch 4a (Dibrugarh-Kaziranga) or Assam Despatch 4b (Kaziranga-Guwahati. Assam boasts two out of India’s five UNESCO environmental World Heritage sites, and we have devised this 7-night package to provide visits to both these sites, Manas and Kaziranga National Parks, together with a short cruise on the mighty Brahmaputra River and an exploration of the little-visited Orang National Park. Manas enjoys stunning scenery, backed by the jungle-covered hills of Bhutan, while Kaziranga boasts a wide range of easily seen wildlife, the many rhinoceros being the outstanding feature. On the river and the sand islands which dot it one can often see great flocks of migrating waterfowl, and there is also a good chance of seeing the rare Gangetic Dolphin. Ganges and Hugli cruises can be taken separately or together to offer a choice of durations from 4 to 15 nights. Ganges and Hugli cruises upstream from Kolkata are all about visits to villages, towns, temples and monuments in a little-known but fascinating and culturally rich part of India, on foot, by cycle rickshaw or minibus. The Sonepur Cattle Fair, on the banks of the Ganges in rural Bihar, is one of India’s great undiscovered spectacles, and we are able to anchor offshore to visit it in comfort. 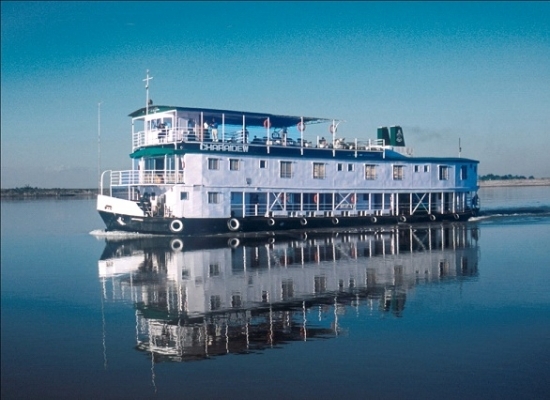 Cruises on the Hugli operate all year round, while the Ganges cruises operate in the winter months only, and the Sonepur Cattle Fair occurs around the Full Moon in autumn. 7-night Ganges cruises from Patna right up to the city of Varanasi. With ABN’s specially-designed new ship, ABN RAJMAHAL, we are proud to announce the inauguration of regular weekly departure 7-night Ganges cruises from Patna right up to the city of Varanasi.